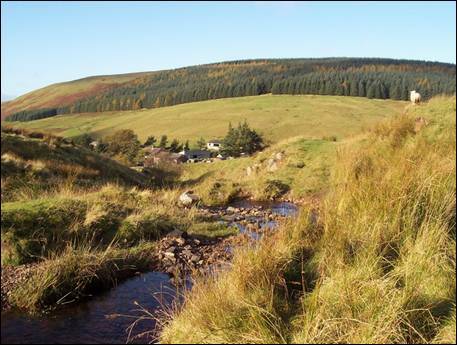 The lower reaches of the Usway Burn, from the tree-clad Hosden Law to the mighty River Coquet, are dominated by the broad backed Shillhope Law. The thread-thin burn wriggles between seemingly near vertical hillsides, punctuated only by the occasional cleugh, sike and hope. To the north, Bloodybush Edge and Yarnspath Law look down on Uswayford, one of Northumberland`s most isolated farmsteads. Nearby, the rarely visited Clay Burn flows into the Usway Burn at one of the most idyllic locations in the Cheviot Hills. This walk follows a figure of eight route and unveils a pocket full of outstanding views. Along the way it drops in to visit some old acquaintances. You will be pleased to see them. 1. 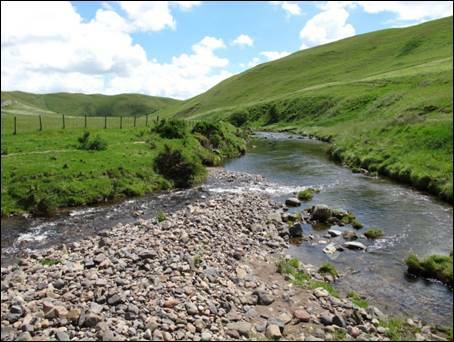 The River Coquet is Northumberland`s longest river, stretching more than 50 miles from its source on the remote slopes of Brownhart Law to Amble on the North Sea coast. It is also arguably the finest. A 3 mile switchback journey, along a single track unclassified road, from the village of Alwinton leads you to the buildings of Shillmoor and an area colonised by the monasteries in medieval times. There is ample road side parking beside the River Coquet, immediately before the bridge (GR NT884078). Bootlaces tied and sandwiches packed, now it is time to cross over the 1932-built bridge and to turn right along the access road to Shillmoor, past two stone-faced semi-detached houses on your left. The farmstead of Shillmoor is now owned by the MoD so do not be surprised to see an Army vehicle or two. There is no reason to feel intimidated, you are perfectly free to walk this way and to cross land which forms part of the dry training area. Before arriving at the farm buildings, turn left up a gravel track, cross over a cattle grid and enter the steep sided valley of the Usway Burn. Already there is a feeling that you have walked into a hidden world. Keep with the track as it heads north, with the chattering burn to your right, and, after crossing over the first bridge (GR NT885087), leave the track to the right and start the lung testing climb up the steep hillside. 2. Follow the good, green track, which runs just above and to the left of the amphitheatre-shaped `Spit Hopes`, following a fairly obvious `nose` towards a meeting with Copper Snout around the 420 metre contour. The gradient will demand that you take your time, so be sure to enjoy the superb views down to the valley you have just left behind and to Upper Coquetdale. On joining the track (GR NT890095) which climbs Copper Snout, a directional fingerpost points your way. Turn left. The summit of Saughy Hill is now in view and the track begins to level off. The trees of the 5,190 acre Kidland Forest, one of the few remaining refuges of the endangered red squirrel, can be seen ahead. Cross over the step stile beneath the slopes of the tempting Saughy Hill, best left for another day, turn right and a somewhat boggy path will quickly lead you to the gravel track of Clennell Steet. This is a `five star` Cheviot drove road, named in a monastic charter during the reign of King Henry II as, `the great road of Yarnspeth`, and used, therefore, since `time immemorial`. Turn left and start your first journey of the day along a `road` which was once the haunt of cattle reivers, drovers and whisky smugglers. You are following in an awful lot of footsteps! 3. After 1 mile, just prior to Hosden Hope (GR NT893117), the track splits in two and from here there are splendid views to Shillhope Law and the distant border hills. 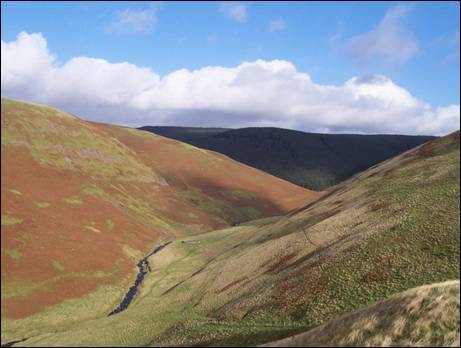 The route of Clennell Street follows the left hand spur whilst your route takes the right hand one, heading through a stretch of freshly replanted forest. Keep with the main track, ignoring the side track which heads to your right after approximately 200 metres. You are now walking part of the route of the now defunct 14 mile Alwinton Fell Race which was first run in 1986. The course record of 1hr. 26m.05s. was set by Peter Dymoke in 1991. After nearly 1 mile of easy walking, when the track begins to curve to the right, follow the thin, easy-to-miss path which cuts through the small gap in the trees to your left and then cross over the step stile. Turn to your right (GR NT888132) and, keeping close to the forest edge, continue across fairly damp ground gradually dropping downhill towards the saddle between Yarnspath Law and Bloodybush Edge. Climb over the five bar gate or alternatively cross over the step stile slightly to the left and, once on the other side, head straight on. There are fine views to the distant Cheviot. The quad track heads downhill in the direction of the remote farmstead of Uswayford (GR NT887145) and is potentially boggy in places. As you lose height the farm buildings come into view, with the extensive Uswayford Forest sweeping across the hilltops on the opposite side of the valley. 4. This section of the walk is part of the rarely travelled Reivers Way, a long distance route of 150 miles which passes through a wide variety of the Northumberland countryside, including more than 25 miles of the Cheviot Hills. On reaching Uswayford, cross over the step stile next to a five bar gate, ignore the second step stile and then pass through the nearby small gate on your right. Keep to the right of the buildings and follow the public footpath which heads downhill and along the right hand bank of the Usway Burn. When you draw level with the wooden footbridge, cross the step stile over the post and wire fence which climbs away from the burn. Turning away from the fence head slightly uphill to pick up the thin hillside-contouring path, in reality little more than a sheep trace, which heads in a northerly direction above the Usway Burn. Soon you will reach the point where the Clay Burn joins the Usway Burn (GR NT886149). Note the circular sheep stell on the opposite bank of the burn. This is one of the most idyllic places in the Cheviot Hills and one to savour. Perhaps by now you will be feeling the pangs of hunger setting in! So, tuck into your `bait` and enjoy the tranquillity. Once done, cross over the Clay Burn, at its narrowest point, and follow the path which climbs uphill, turning slightly to the right as it heads towards the forest. At the top of the short hill cross over the step stile and head straight on. 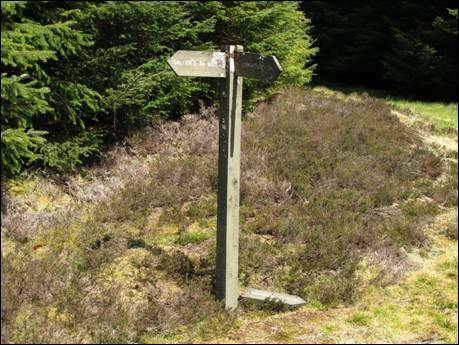 Continue along the forest ride, on a clear path, and before long you will reach a sign post indicating that you have now joined the Salter`s Road (GR NT886155), an ancient cross-border track running from the village of Alnham to Cocklawfoot in Scotland. Your route heads to the east, so turn right and head through the forest. 5. As the track makes its way towards the eastern edge of the forest, which crosses the saddle between Lint Lands and Bloodybush Edge, be sure to follow the muddy track climbing slightly to your left, away from the firmer main forest track, which now curves to the right. Once at the forest edge (GR NT904157), facing downhill towards the distant Upper Breamish Valley, it is time to put on your climbing boots. Go through the gate, turn right and commence your ascent of the northern slopes of Bloodybush Edge. After a gentle start, the path becomes steeper as it cuts its way through a series of peat hags, eventually leading you directly to the triangulation pillar on the 610 metre top. This is the sixth highest summit in the Cheviot Hills and from here there are fine views northwards of the area`s three highest hills, The Cheviot, Hedgehope Hill and Comb Fell. To the south, the vast acreage of the Kidland Forest stretches below you. For the next mile and a half you continue across high ground as you aim for the summit of Yarnspath Law. So facing north west and with the triangulation pillar behind you, follow the middle of the three fences which descends to the saddle between Bloodybush Edge and Yarnspath Law. You will recall this spot from an hour or so ago! Keeping close to the fence, continue across the saddle and then uphill to the barely noticeable summit of the 540 metre high Yarnspath Law. With nothing of note to detain you, continue forwards until you reach the point where the hill begins its sharp descent. Pause awhile and soak up the excellent panorama of the border hills. Follow the fence and the faint quad track downhill, over mat grass covered slopes, until you reach a clear track (GR NT879128). The erect spikes, which the mat grass produces in June, bleach to almost white as autumn approaches and these areas are referred to locally as `whitelands`. Cross over the step stile and, with feet firmly once again on the route of the ancient Clennell Street, follow the rutted track south eastwards for the next 1¾ miles. 6. This is easy forest walking along a once beautiful green track and, after just over 1 mile, you will re-join your outward route alongside Hosden Hope. 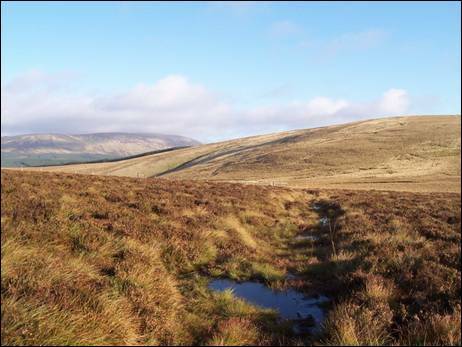 Keep straight on, staying with Clennell Street until you reach, after a further ½ mile, the small `dip` just prior to Saughy Hill and a directional marker post on your left. Now you must leave Clennell Street by turning right and crossing a step stile adjacent to a five bar gate. Follow the yellow arrowed public footpath across initially exceedingly damp ground (GR NT894109) on a 1¾ mile walk down the south western extension of Nettlehope Hill towards the deep and narrow valley of the Usway Burn. Rising high on the slopes of Cairn Hill, half way between the Hanging Stone and Scotsman`s Knowe, the headwaters of this delightful burn lie within shouting distance of the watershed of not only the River Breamish but also the Harthope Burn. 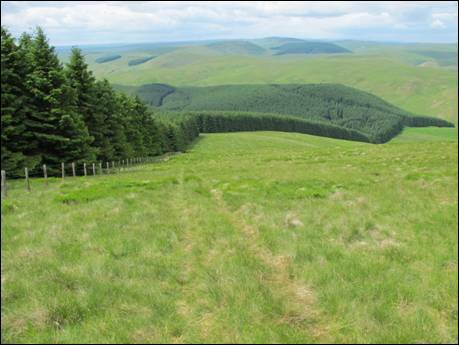 The track is easy to follow so, as you tumble downhill enjoy the views of Shillhope Law and the vast array of border hills that sweep across the skyline. When the track makes a 90° turn to the south east be sure to make a short diversion, via a five bar gate on your right, to reach the top of The Castles and `Premier League` views to the valley below. Back on the main route, head downhill next to the post and wire fence and then across a waymarked step stile. Continue downwards on a lovely green path crossing Barley Sike as you approach the peaceful farm named on the Ordnance Survey map as Batailshiel Haugh (GR NT882101). The farm, known to locals as `Battleshield`, was referred to in the 13th century charter of Newminster Monastery as “ the shiel of Henry de Bataile” .The word `shiel` derives from the Norse meaning `summer pasture` and the word `haugh` means `flat land beside a river or burn`. The old farm building was demolished in 2003 and the site is now occupied by a bungalow. 7. The path now climbs around the back of the farm, crossing en route Mid Hope, before joining the gravel road away from the farm. The road twists and turns over a number of bridges as it heads down the narrow valley back to Shillmoor and the majestic River Coquet. When you reach the third bridge, at the point where you left the valley on your outward journey, do not cross over. Instead, stay with the eastern bank of the burn and follow the faint and intermittent path alongside a fence and beneath steeply rising hillsides. This path is marked on the Ordnance Survey map as `Pass Peth` and is part of an ancient cross-border route from Alwinton. Eventually, some 400 metres from the buildings of Shillmoor, you will pass the site of what is believed to have been a post-medieval farmstead. The building measured 15 metres by 5 metres, had two rooms of unequal size, a west facing entrance and was close to two small fields. Unfortunately, there is now little to be seen. As you reach the buildings of Shillmoor, on the opposite side of the burn, head for the wooden footbridge, cross over and aim to the left of the farmstead. You will now see your starting point a short distance ahead and a simple stroll alongside the River Coquet takes you back to your car. You can now relax and enjoy the delightful surroundings.